My Mushu! – Butter, Baking, and Bacon! One of my very, very best friends is such a cool cat. We both LOVE watching the Disney hit “Mulan” and the classic “The Wiz” together! He does a GREAT, “I am the great stone dragon! I will go forth and fetch Mulan!” imitation! It is an instant pick-me-up for any day! He is so down to earth and extremely intellectual. 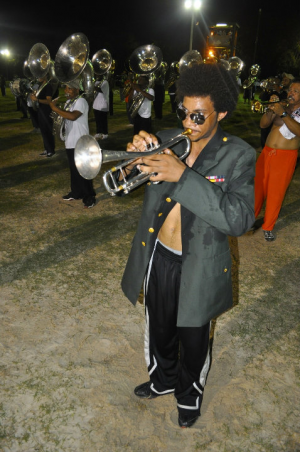 He is also a PHENOMENAL trumpet player and is a member of the world reknowned Marching 100! Recently, Daniel transitioned to a vegan diet. It was very important for me to learn some tasty vegan dishes to fill his tummy. I’ve developed vegan cupcakes, vegan “cheesecakes”, roasted stuffed peppers, and yes, even a variation of macaroni and cheese! Boil water in a big pot for the pasta. Blend every ingredient except for the macaroni noodles into a food processor or blender. Once the pasta has boiled for 8 minutes, drain and place in large baking dish. Pour the blended sauce over the noodles and bake for 10 minutes until golden brown. Serve hot and enjoy! wow! these are so sumptuously gorgeous looking! Hmm. I have been trying to transition to a vegan diet for the past couple of months, but I couldn’t fathom how I could get by without wonderful cheese. I will have to try this recipe. It sounds great, thanks! I hope your transition is going well!! !